Steven Harper notched an entry into the $1.1K LAPC Main Event Satellite running on weekends preceding the Main, by cashing in one of the nightly $150 Step 1 satellites. A cash in the $1.1K Satellite (another batch run in the days just before the Main Event starts 27 February) gets you one of the coveted $10K seats. Harper also took seventh place in the $240 NLHE Big Bounty tournament on Monday, picking up eight $100 bounties to go along with the prize money. Hoping to get down to LA myself in the next few weeks. I didn’t get a chance to play any of the preliminary events at Tulalip this week, but I plan to be there for Day 1A of the Main Event on Thursday (and back for Day 2 on Sunday, natch). Got a little bit of a bankroll boost by taking second in Friday’s $11K guarantee at Encore Friday night but couldn’t play the $35K on Saturday. Just saw the announcement of this year’s spring event at Muckleshoot (no more Omaha! ), concluding as usual with a two-day $750 Main Event. 16–21 March, with satellites for seats in multiple events the three days before the series and Wednesday evenings beginning 17 February. 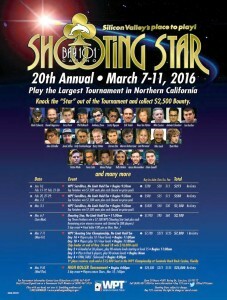 The Shooting Star at San Jose’s Bay 101 casino is the closest premiere poker tournament to Portland. It’s been on the WPT schedule since season II (they’re now in Season XIV). It started as a $5.3K buy-in, going to a $10K for most of its run, and for the past couple of years, it’s been offered as a $7.5K. It’s unique on the WPT schedule for having a $2.5K bounty on 50 “star” players seeded through the tables. Unlike most of the other WPT Main Events, there aren’t a lot of side events. Aside from the Main Event’s two starting days on 7 and 8 March, there’s a two-day $2.1K buy-in event on 6 March, and a 2-day $25K High Roller tournament on 9 March. 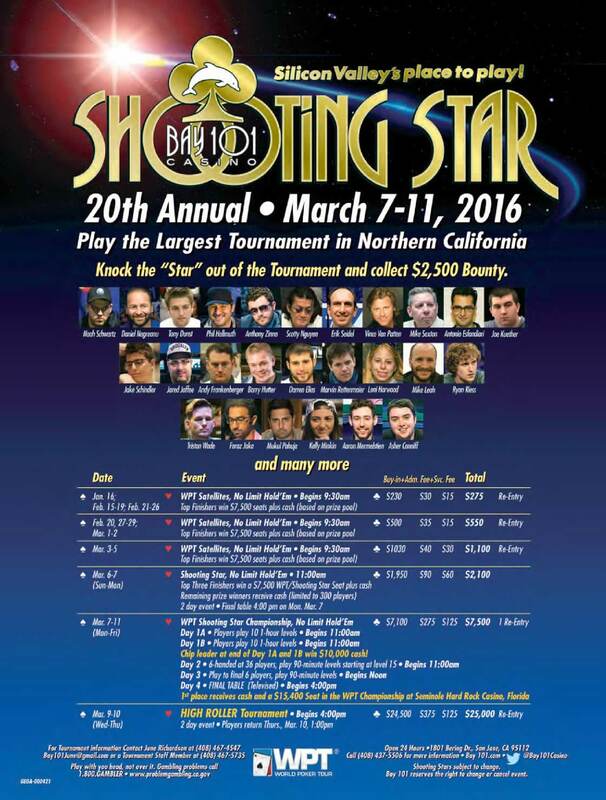 Unlike the Commerce in LA—where the WPT $10K LAPC Main Event starts a week earlier—Bay 101 is a small venue. Capacity for the $2.1K is just 250 players, But the multiple starting days and slightly smaller buy-in mean the number of players is for the Main is larger (more than 700 at Shooting Star vs. about 540 for LAPC over the past couple of years) and the payouts at the top have actually been larger. Do I think everyone in Portland should just pony up $7.5K for a chance at what’s considered one of the best values in poker (due to the atmosphere of the event and the number of Silicon Valley locals with money who aren’t necessarily fantastic deepstack poker players)? No. But due to the Bay Area’s proximity, and the fact that so many people here do business there on a regular basis, the potential value in slipping into the Shooting Star via one of the many satellites Bay 101 runs in the lead-up to the series can’t be ignored. The first mega-satellite in December paid out seven seats. This month’s $275 mega has passed, but they begin to run daily 16–26 February (except Saturday, 20 February) at 9:30am (there’s also a President’s Day—15 February—mega at 8:15am). There are six $550 satellites between 20February and 2 March, and three $1.1K satellites 3–5 March, all of which begin at 9:30am. So if you have reason to be in Northern California sometime in the second half of next month, you might want to book an extra day and fly through SJC. Bay 101’s only a mile or so away from the terminal. The LA Poker Classic at Commerce Casino runs through early March. Thunder Valley’s edition of Poker Night in America concludes this weekend with a $1,650 televised Main Event. Starting days a re Friday and Saturday, with final table filming on Monday. 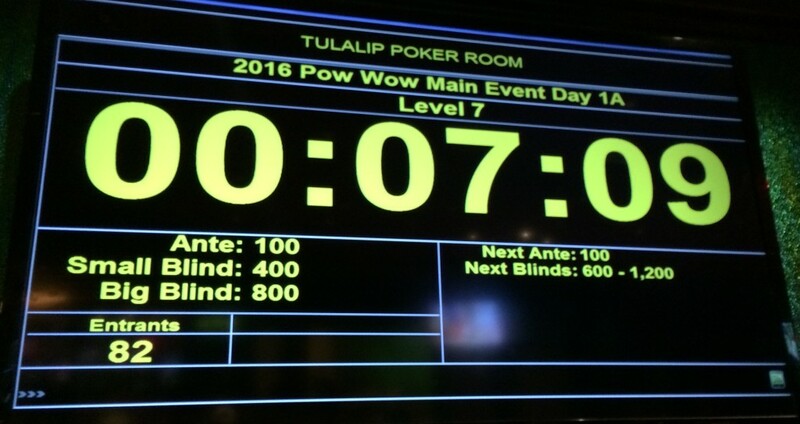 The Tulalip Poker Pow Wow Main Event has starts Thursday, Friday, and Saturday, with Day 2 on Sunday. The Venetian Deepstack Extravaganza is under way and running through 2 March. They started up a blog last fall for info and results; you can find it here. Planet Hollywood’s Phamous Weekend runs Thursday through Sunday, offering a $250K guarantee tournament ($600 entry), plus some Big O and mixed PLO8/Big O. The Talking Stick Staycation Weekend I mentioned last month is this weekend. Muckleshoot’s Fifth Sunday tournament may be the backup option for folks in Seattle for the Tulalip Pow Wow, who want a big tournament but busted out of the Main Event. It’s a $3K added, $330 buy-in at noon on Sunday. Calgary’s Deerfoot Casino has its annual Winter Super Stack from 3–16 February. It kicks off next Thursday with a C$550 buy-in with a C$100K guarantee, featuring 15 events, including the C$1.5K Main Event (C$200K guarantee, 3 starting days, 3 days total), a C$330 PLO Bounty(!) tournament, C$1.1K Heads Up PLO, and C$5K High Roller. The Canadian dollar’s only about 71¢ right now, round-trip flights to Calgary are only about $400, and the weather forecast for the start of the series has nightly lows of -2°F! But since you’re in Canada it’ll be -14°! Aria has two more $25K High Roller events Friday and Saturday. See Poker Telegraph for info on past events. Portland (and PNW)-area players got off to a great start for the year at Commerce Casino, where Dan “Goofy” Beecher and Allen Oh made the final tables of the first two events. Beecher came in sixth in the $100K guarantee Event #1, and Oh got to heads-up in Event #2, a $150K guarantee, after a five-way deal and a wild agreement to play all-in-or-fold for an extra $4K. Tshering Sherpa and Angela Jordison both cashed in Event #2, with Sherpa just missing the final table (and LAPC’s reporting missing his finish). No PNW finishers in Event #3, a Limit Omaha Hi-Lo event, or the first flight of the $250K guarantee (Event #4, Turbo NLHE), but there’s still time to get into some of the action on the latter: flights run through Saturday. The series runs all through February, you can follow the action at lapcnews.com. Hopefully, a lot of you took advantage of the free drawing for an Aussie Millions Main Event seat last week. According to a message from the promo company that contacted me, there weren’t a huge number of entries overall (which is probably why they were reaching out to bloggers half-way across the world), so your chances are waaaay better than the lottery. I know that if I win a seat, I’ll be selling action (or trying to) below par to round up money for the trip. Let me know if you end up going yourself! Did you somehow miss last week’s announcement of the winter series at Chinook Winds? Nine guaranteed events over nine days, beginning on 20 February. It kicks off with a $330, $50K guarantee NLHE 6-Max tournament and ends with a $750 (including add-on) $100K NLHE Main Event. Along the way, there’sa bounty tournament, Limit Omaha Hi-Lo, Big O, and lots of satellites. The fly in the ointment is the unconventional 55+ age restriction on the Seniors event. Most everywhere else it’s 50+ but I guess the oldsters don’t want to be terrorized by the likes of the Poker Mutant. Lincoln City is the closest location to Portland with a series of this scope. It’s still a bit of a drive for a commute from the city—especially if you’re there to the end of a long tournament day and have to come back for a Day 2—but it’s doable. The poker room itself fills up with cash games on the weekends; it can be a little slow getting started in the days during the week. Last time I was down there, they were running Seven Card Stud cash games on Fridays. Tickets for the series are on sale through Chinook Winds’ online ticketing; you still have to go to the ticket office to pick up your tickets and buy any dealer add-on at the tournament registration desk when you get seat assignments. 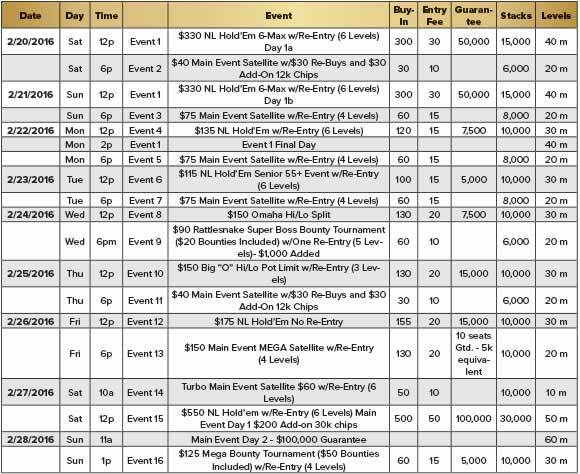 This weekend is the $35K at Encore Club that seems to be turning into a monthly event. 1pm, $200 entry/re-entry, and an $80 add-on at the first break. The LA Poker Classic at Commerce Casino runs through early March. I went into detail about the schedule in a Deal back in November. The Wynn Signature Weekend in Las Vegas, a 3-entry-day, $600 entry, $250K guarantee NLHE event, starts tomorrow, with Day 2 on Sunday (1/24). Poker Night in America at Thunder Valley begins tomorrow. The first non-satellite event is a $425 buy-in $200K guarantee NLHE tournament with four entry flights over Thursday, Friday, and Saturday, and a live-streamed final table on Sunday (1/24). There are nine other events with smaller guarantees ($7.5K to $25K) before the $1650 Main Event, which is recorded for television. They’re also running satellites for a $10K buy-in to their $25/$50 televised cash game. Aria has updated their web site, but their poker page still doesn’t carry any information about their $25K buy-in High Roller events. This Friday and Saturday are the latest. Poker Telegraph carries info about previous events. The Tulalip Poker Pow Wow (see last week) starts Friday. The Venetian Deepstack Extravaganza gets going Monday. Planet Hollywood’s Phamous Weekend piggybacks on the Venetian Deepstack 28-31 January, by offering a $250K guarantee tournament ($600 entry), plus some Big O and mixed PLO8/Big O. The Talking Stick Staycation Weekend I mentioned last month is coming up on the 29th. Play all three tournaments and you get two nights stay for free at the resort. I hope everyone’s year’s gotten off to a good start. Are we winning? At least we’re back to normal winter weather in Portland. The perfect kind of weather for being inside playing poker in the warm and dry. Got a DM Tuesday from one of the Aussie Millions promotional companies. They’ve got a drawing for a seat to the Aussie Millions Main Event. The Main Event has three starting days: 24-26 January and runs for a total of five days. 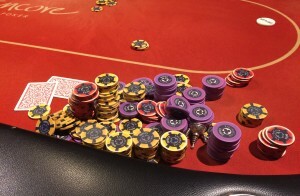 It’s a AU$10.6K buy-in (US$7.4K) at Crown Casino in Melbourne. The flight alone’s going to cost $2K. But it is one of the premiere events in the world of poker, last year there were nearly 650 entries and the prize pool was over US$5M. And the Crown is 18+, so if you’re locked out of Portland poker because of Portland Players Club’s closing as the last of the alcohol-free clubs…. Competition closes at midnight on January 14th Melbourne time, which is 5am Thursday morning here, so if you’re going to enter, make sure you do it today. The entry form’s built for Australian and New Zealand players, so you have to trick the phone number and zip fields. You can just type in the first four number of your ZIP for the postal code, but Australian phone numbers are eight digits with a two-digit prefix. It’s the same number of digits as US phone numbers, but the first two digits have to be in the range 02-08. If your number’s 503-555-1212, just use 0355551212 and it should work. What have you got to lose? My focus on the site is mostly on tournaments (hence the title “Pacific NW Tournament Calendar,” duh), but there are a lot of “shootouts” around town. Technically, most of them are hour-long tournaments with one blind level, unlimited rebuys, and a chip chop at the end of the tournament. Most of them are Hold’em (big surprise) but there’s one game that’s had a few homes where those of us with a penchant for odd games can get some more cards: the Monday Mix game hosted by Devin Sweet. The Mix offers a wide variety of games, with 20 or so different variations of Omaha, Stud, Badugi, and more, in addition to Hold’em. Blinds for the flop games are 1/1 1/2 (corrected per Mix dealer Josh Harding). The Stud games are played 5-25 spread limit. My own personal opinion is that takes most of the interest out of limit stud games, with a $600 max buy-in and five rounds of betting that can go to $100, you might as well just toss in your chips and draw for a high card, but some people like it. Monday nights at 7pm. Rialto is also offering Sunday noon games of 4/8 Limit Omaha Hi-Lo, in addition to NLHE at other times. Check the NW Poker Facebook page for notices. The schedule for Oregon’s other poker series, the PacWest Poker Classic at Chinook Winds the last week of February is up. The schedule in the Tournament Guide PDF has some incorrect dates, but a spot check of the dates on the structure sheets themselves looks okay. More on this later! Note to other old people, PacWest’s Seniors tournament is 55+, not 50+. This year’s Poker Pow Wow is coming right up. It has five events over two weekends, from Friday, 22 January to Sunday, 31 January. Event 1. NLHE. $235 buy-in, Friday and Saturday entry days (1/22-23) with Day 2 on Sunday 1/24. 30-minute levels on Day 1, 40 minutes on Day 2. Event 2. PLO8. $150 buy-in. One day (Monday, 1/25). 30-minute levels. Event 3. 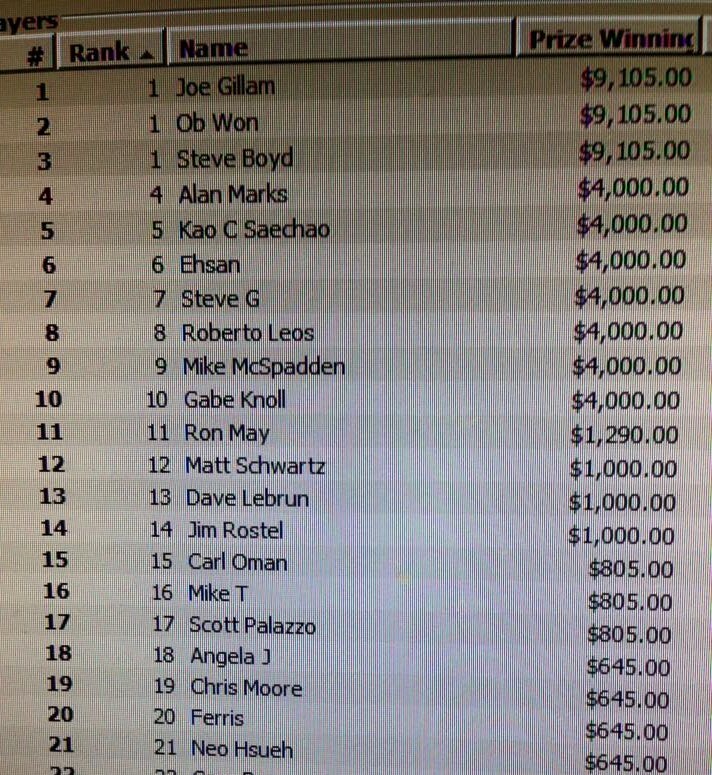 NLHE Seniors (usually 50+, but after seeing PacWest, what do I know?). $235 buy-in. One day (Tuesday, 1/26). 30-minute levels. Event 4. PLO. $235 buy-in. One day (Wednesday. 1/27). 30-minute levels. Event 5. NLHE Main Event with $10K added. $500 buy-in. Three entry days (Thursday-Saturday, 1/28-30) with Day 2 on Sunday, 1/31. 40-minute levels on Day 1, 60-minute levels on Day 2. @pokermutant @TulalipPoker last time I checked in they were 8 table maximum due to the new poker room. Has has that changed? 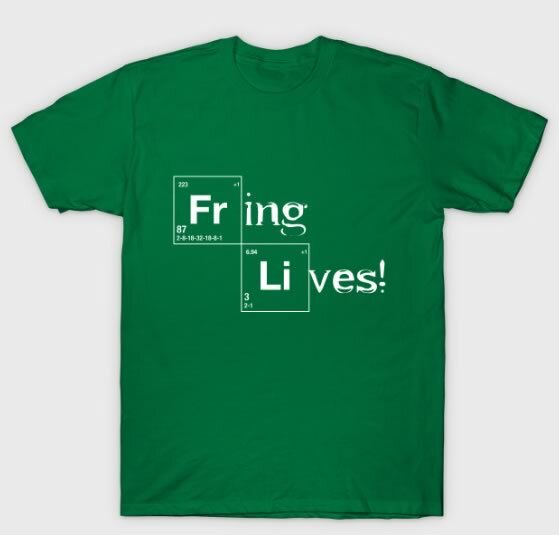 @pokermutant @clarke206 @FloydBangerter Yes! There's no cap on number of players. We will seat 110 plus alternates. As I’m putting this report together Tuesday, I haven’t seen any announcements for special events for the next week; everyone seems to be on their regular schedules until next weekend. In LA, the Liz Flynt Poker Championship has two more entry days (two flights each today and tomorrow, with a final day on Friday). It’s a $200K guarantee with a $275 buy-in and six entry flights over three days. 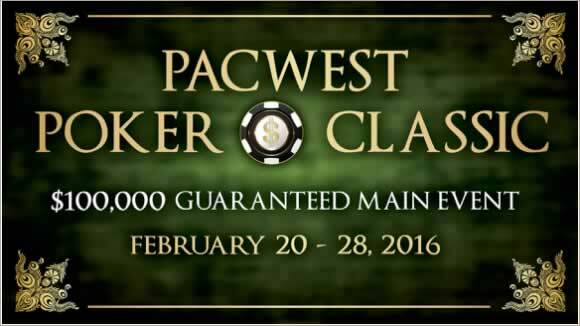 The LA Poker Classic at Commerce Casino starts Friday and runs through early March. I went into detail about the schedule in a Deal back in November. The Wynn Signature Weekend in Las Vegas, a 3-entry-day, $600 entry, $250K guarantee NLHE event, starts next Thursday (1/21), with Day 2 on Sunday (1/24). Thunder Valley outside Sacramento is hosting Poker Night in America starting next Thursday (1/21). The first non-satellite event is a $425 buy-in $200K guarantee NLHE tournament with four entry flights over Thursday, Friday, and Saturday, and a live-streamed final table on Sunday (1/24). There are nine other events with smaller guarantees ($7.5K to $25K) before the $1650 Main Event, which is recorded for television. They’re also running satellites for a $10K buy-in to their $25/$50 televised cash game. Aria has updated their web site, but their poker page still doesn’t carry any information about their $25K buy-in High Roller events. They’ve got two more next Friday (1/22) and Saturday (1/23). You can read about past events at Poker Telegraph. If you have to ask, you can’t afford it. The Tulalip Poker Pow Wow (see above) starts a week from Friday (1/22). There’s an Ante Up Cruise to the Mexican Riviera (Cabo San Lucas, Mazatlan, Puerto Vallarta) coming up Sunday, 24 January if you’re looking for some last-minute relief from the rain. Small events ($20-$100) with a $300 championship. Plus whatever they’re charging for the ship, of course. The first Venetian Deepstack Extravaganza of 2016 gets under way a week from Monday (1/25) and runs until March. Got a DM today from one of the Aussie Millions promotional companies. They’ve got a drawing for a seat to the Aussie Millions Main Event. The Main Event has three starting days: 24-26 January and runs for a total of five days. It’s a AU$10.6K buy-in (US$7.4K) at Crown Casino in Melbourne. The flight alone’s going to cost $2K. But it is one of the premiere events in the world of poker, last year there were nearly 650 entries and the prize pool was over US$5M. And the Crown is 18+, so if you’re locked out of Portland poker because of Portland Players Club’s closing as the last of the alcohol-free clubs…. I’ve typed in the new year…. Winter weather tends to hit the Portland area hard, since freezing temperatures here generally mean ice rather than snow. Yeah, yeah, everyone from Eastern Oregon and Colorado and the East Coast, you know how to drive in snow, Portland doesn’t know how to keep the streets clear of snow, yadda, yadda, yadda…. None of you suckers are good on ice. Anyway, conditions led to some closures and delays in poker schedules around town. The storm didn’t hit until after the big events for the weekend in Portland were over, but Black Diamond Poker Room in Albany had to reschedule last Sunday’s $310 Deepstack tournament for next Sunday. I first met Chadd Baker shortly after poker’s Black Friday. I got an invitation to Portland Players Club—which he’d purchased early in the year—for a promotional freeroll tournament. I won it—my first live MTT win—after a couple of years playing in the home game that was my re-introduction to poker. PPC had been around before Chadd in its location above Biddie McGraw’s at NE 60th & Glisan, it was profiled in Bluff magazine (which disappeared into the void recently), but Chadd had been trying to sell it over the past year. PPC’s been a favorite place to play for me, with cheap buy-ins and door fees, 11am start times for the first tournament, and a selection of games other than NLHE: mostly Big O these days, but HORSE, PLO, PLO8, and more. It was close to my house: I could walk there in about 30 minutes and drive there in less than 10. Through it all, Chadd’s been there night and day. Putting together the web site, posting to Facebook, texting players to get them in to play, wrangling volunteer dealers (who are themselves some of the best and most experienced non-Hold’em dealers you’ll ever run across), making sandwiches, blending great shakes, cleaning, stocking, etc. The club was usually open late; Chadd would be there at opening and through the evening game most every day of the long poker week. How he found time to have a wife and child boggles my mind. Anyway, this phase of Portland Players Club is at an end. The last game was the day before New Year’s Eve. 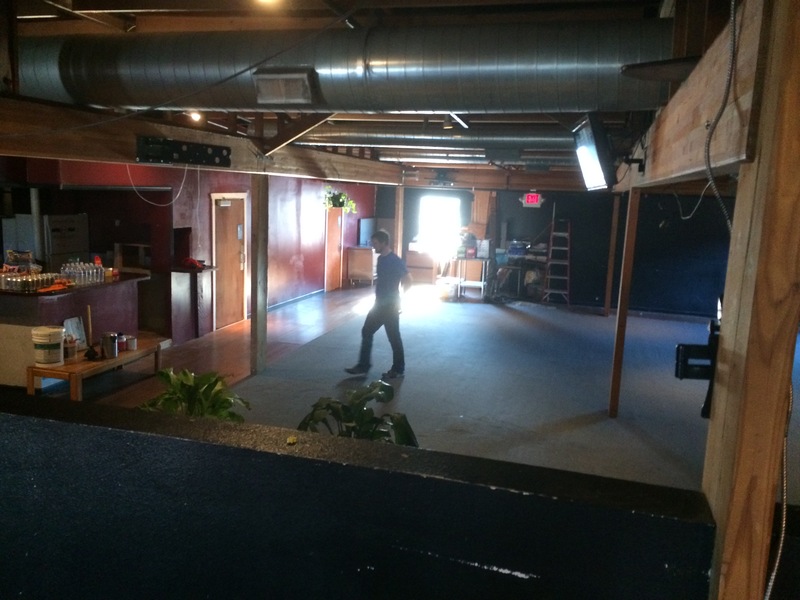 All but one of the tables in the club was gone. I’m going to miss the old place. I met a lot of interesting characters—and a few folks I consider friends—at PPC. It was the kind of place that I though might be cool to own myself if I had the money to keep the place running—I can’t imagine Chadd was making a giant profit—except for the fact that I knew how much time and effort he put in to the job. He’s a better man than I am. I’ll just have to settle for imagining Chadd running my imaginary poker club. 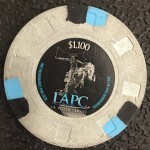 There’s nothing not to like about the LAPC at Commerce Casino. It’s got a huge amount of action at the Largest Card Casino in the World™. For more than a month-and-a-half, from a $175 buy-in $100K guarantee a week from Friday to the $10K WPT Championship that wraps up 3 March, there’s something for nearly everyone. A lot of side events at LAPC are non-Hold’em tournaments, which may make it more appealing to those of us who like a little variety, compared to the World Series of Poker. There are trade-offs: Buy-ins at LAPC aren’t as large. LA’s a bit more expensive to get around without a car than Vegas. But who could pass up a $350 Crazy Pineapple 8 or Better tournament? The first two full weeks of the series (1/17-30) have some particular appeal. Apart from a $100K NLHE Bounty game on the first Sunday ($350 buy-in, $100 bounties) and a $250K guarantee NLHE Turbo with $240 buy-in (eight starting flights through the week, with Day 2 on the 25th), there arr 1pm games (mostly $350 buy-ins) of Limit Omaha Hi-Lo, Triple Stud (7-Card Stud Hi and Hi-lo, and Razz), mixed Omaha Hi-Lo and 7-Card Stud Hi-Lo, PLO, PLO8, Limit Hold’em, HORSE, NLHE All In Or Fold, not to mention nightly satellites to the Main Event at the end of February. Plus, if you get on the list early and can get over to the Bicycle Casino with an extra $500+ in your pocket, you might be able to play 5/5 PLO on Live At the Bike with Abe Limon in the commentary booth. Encore Club has a special $8K tournament tonight at 8pm, $50 buy-in, $25 add-on, no re-entry or re-buy. They’ve announced another $35K guarantee for the 23rd. The Game has announced a bigger, better Big Shot for the end of the month, with $20K guaranteed to first place. The Venetian New Year’s Extravaganza runs through Sunday. WPTDeepstacks at Hustler Casino in LA continues through the 11th. Followed immediately by the four-day Liz Flynt Poker Championship (January 12-15). The WPTDeepstacks Main Event is $1.1K with a $300K guarantee. The Liz Flynt event is a $200K with a $275 buy-in and six entry flights over three days. Sunday is the rescheduled $317 buy-in Super Deepstack Freezeout at Black Diamond Poker Club in Albany. 1pm start time and 60K in chips. Sunday at Stones Gambling Hall near Sacramento is a two-day $100K guarantee, with a $1,110 buy-in, 40 minute levels, and 60 minutes at the final table (live-streamed). You can see examples of the casino’s live-streamed 5/5 and 5/10 cash games in their Twitch archives.